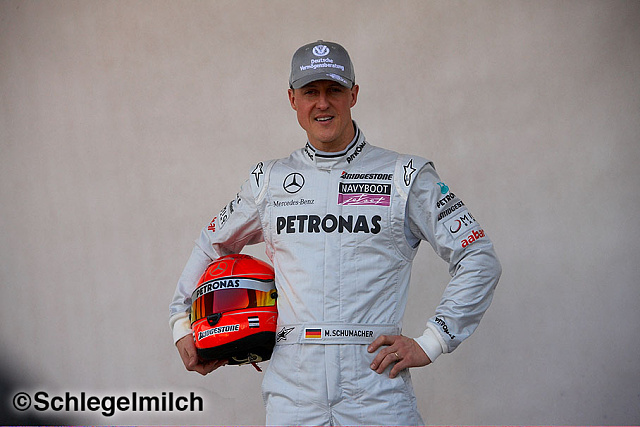 German ace Michael Schumacher is widely recognised as being the world’s best ever racing driver. Michael is a 7 times F1 World Champion and most recently raced for the Mercedes GP Petronas Formula One Team. In 1995 Michael became the (at that time) youngest double Formula 1 World Champion (1994 and 1995 seasons) ever. He is also the 2000, 2001, 2002, 2003 and 2004 World Champion. This phenomenal record speaks for itself. His sixth title in 2003 beat Juan Manuel Fangio’s long standing record of five championships from the 1950s! Schuey announced his retirement from F1 racing at the end of the 2006 season and was retained in a consultancy role by Ferrari. However, over 2010-2012 Michael sensationally returned to F1 racing, signing a 3 year contract to race for the Mercedes GP team. Michael’s last championship title in 2004 was secured before the season end, taking his total number of titles to 7. Memorably, he did this by finishing 2nd at Spa in Belgium, in Ferrari’s 700th race, to accumulate enough points to seal the deal. Michael also holds the F1 records for: most career wins (91), most wins in a season, most career pole positions, most points during a season under the old scoring system (148 in 2004), most consecutive world championships (5), most consecutive race wins (2004), most podium finishes (154), most laps leading, most fastest laps (76), plus several others! Michael was at one point the highest paid racing driver in the world and second highest earning sportsman in the world, earning a reported $80 million US in 2004 ($40m of which was his salary from Ferrari. Whilst they were both racing in F1, his younger brother Ralf was the 3rd highest paid driver in Formula 1 in 1999 and whose pay after the 2000 season was raised to US$15.5 million. Despite an unlucky start to his Formula 1 career with a retirement from his first race in 1991, at age 22, Michael’s skill and tenacity led to his first race win the next year and ultimately his total of 91 race wins and 7 driver’s world championships. Unfortunately, in 2013 Michael suffered a serious head injury during a skiing accident in France. Since then he has been receiving medical care, intially in hospital and now at his family home.